Sometimes the hustle and bustle of the city is too much for Gandalf, so his owners take him to nearby parks. 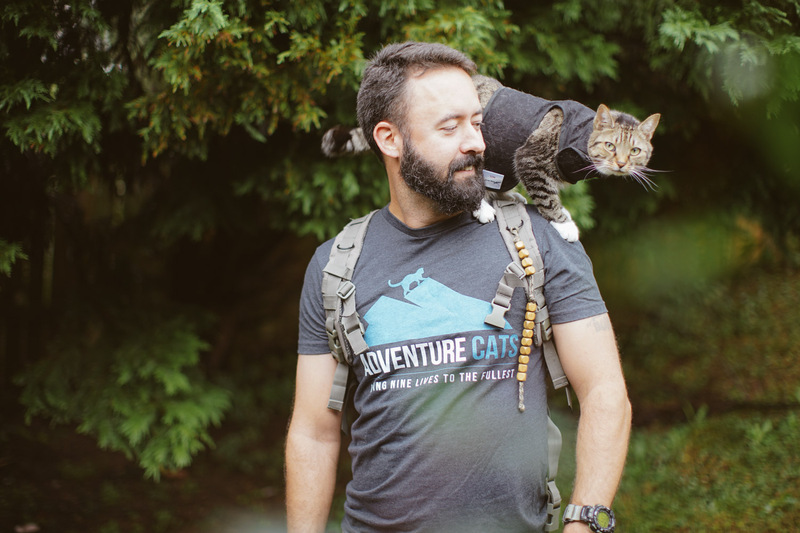 Yes, there is an adventure cat named Gandalf (Gandalf the White, to be exact). And he’s everything we thought he would be and more. 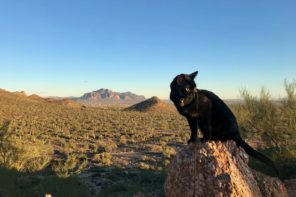 This confident cat can handle his own in the great outdoors — even though he’s been deaf since birth. 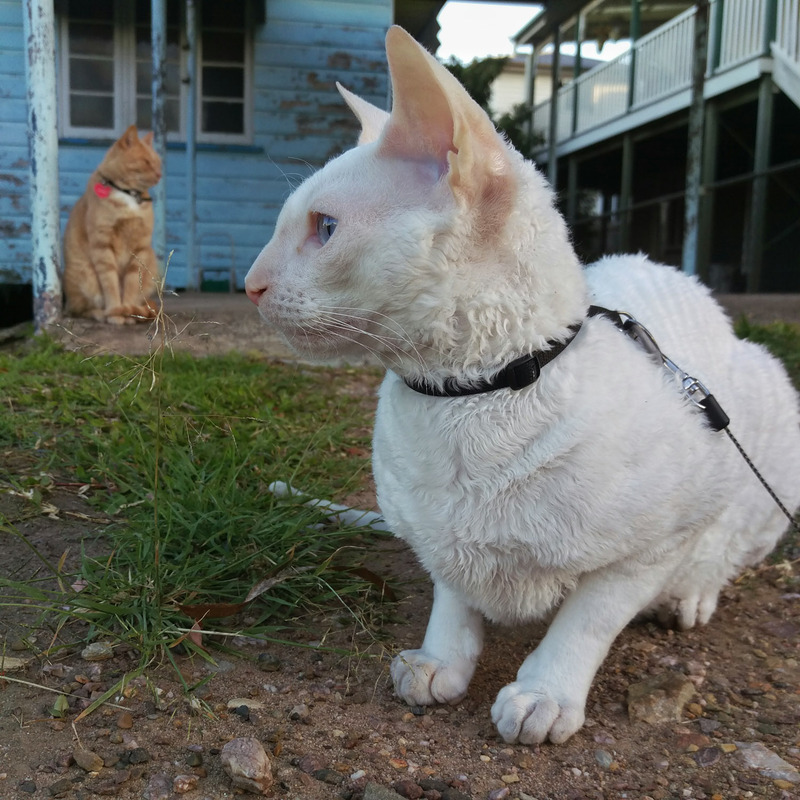 Indeed, Gandalf leads the way on his outdoor excursions with owners Martin Henrion and Benjamin Descher in Brisbane, Australia. 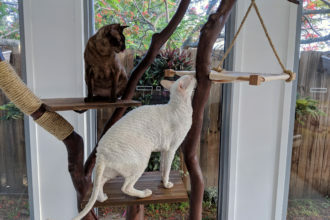 While the white Cornish Rex didn’t make a grand entrance with a pipe in one hand and a wizard’s staff in the other, he most certainly has brought his share of excitement. We talked with Henrion about how Gandalf came into his life and how they started their quest for wilderness fun. 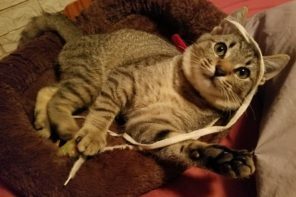 Adventure Cats: Can you tell us a little bit about Gandalf and what makes him special? Martin Henrion: He came to us from Mantang Cornish in Brisbane (Australia) in December 2013. Gosh, where to start, he’s such a character! As you can probably tell, he’s quite the avid explorer and isn’t shy about letting us know it’s time for another adventure by going down to the front door and meowing very loudly. He is also quite sweet though and will happily curl up on our laps at night time to watch some TV or tell us when it’s bedtime by walking to the stairs and raising his chin at us. He loves a good social event, too, and gets along really well with people and other animals, which makes him a perfect fit in our family. Gandalf loves to visit his neighbors. How/When did he start accompanying you on outdoor excursions? What inspired you? The built-up city environment isn’t the safest place for cats, so he is actually an indoor cat when he’s not out adventuring (believe it or not). 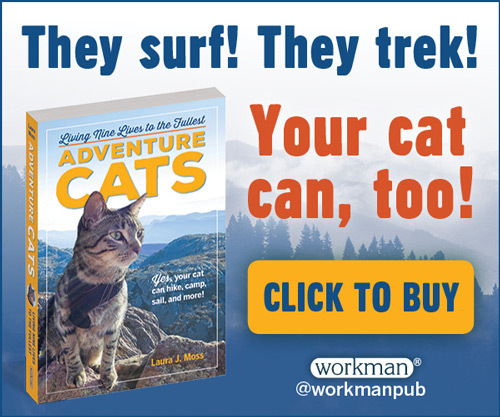 We didn’t want that to stop him from seeing the world though, so we taught him to walk on a lead since he was a young kitten. He comes with us to wherever is practical, safe, and allows pets (sadly most indoor places in Australia aren’t very welcoming of pets) and is always excited to do so. 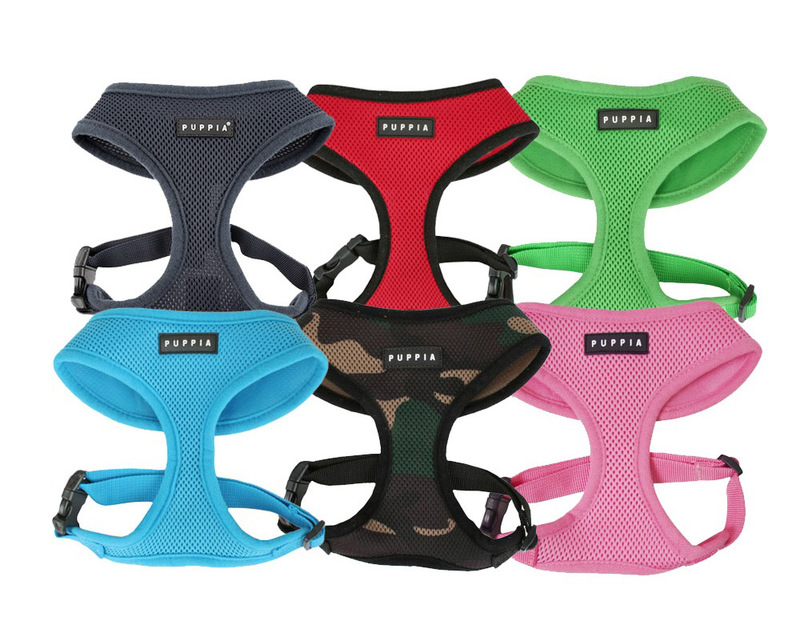 The pet store, friends’ houses, the beach, the park — just say the word and he’s in his carry bag ready to go! What’s a typical excursion like for you and Gandalf? On a weekend we’ll usually go for a drive to somewhere nearby for a walk and get stopped a lot by passersby who ask questions, ranging from “How often do you walk your cat/how did you teach him?” and “What breed is he?” to “Is that his natural hair/do you clipper him/perm his fur?” (… could you imagine? haha), but I like a good chat so I don’t mind. Then on a weekday it’s usually just a stroll around the neighborhood of an afternoon where he’ll lead me to all the houses that have outdoor cats to go and say hello. His adventures are very much led by him and typically move at his pace of choice, which is usually either very slow or very fast. What’s the best part of adventuring with Gandalf? Are there any disadvantages? He just gets so excited about it that it is just a joy to watch. Plus, I also like to get outdoors and enjoy nature but can sometimes be a bit lazy, so he’s an excellent motivator in that regard. I can’t really think of any downsides! Gandalf doesn’t let dogs or water bother him. What’s one of your favorite memories with him? 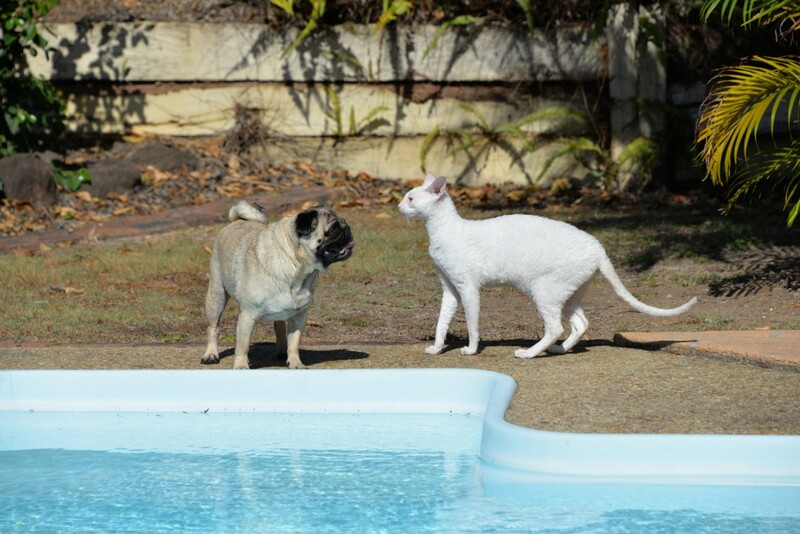 Oh gosh, this is going to make me sound like a negligent cat dad, but we took him around a friend’s place last summer to chill out by the pool, and he went to step onto a flotation toy, not realizing it would drift away and fell in the pool! But I was so proud of him because he just swam to the edge where I lifted him out and he proceeded to go about his business as normal like nothing had happened. I’d never leave him unsupervised though as I think he’d struggle to get out on his own in pools with abrupt edges. Just training initially to get him used to wearing a harness. We let him wear it around the house for a little while until he got used to the feel of it (lots of flopping about and walking backwards). Then next time we took him outside in it and he quickly learned that having the harness on equals outside time and has been happy to wear it ever since. He has also been deaf from birth (genetic), which has impeded him in absolutely no way. 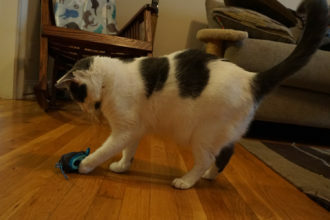 He quickly learned to use vibrations in the floor/ground (or in the air if there is a really loud noise) to replace his lack of hearing, so we use that to get his attention, and he uses it to know when we get home and still comes running to greet us. He also seems to have a very strong sense of smell, which makes walking very slow as everything must be sniffed (haha). What kind of safety precautions do you take for him? 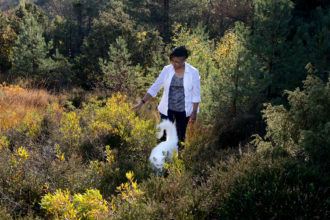 Being deaf has actually made him rather fearless, which does need to be kept in check, so whenever there are dogs nearby I check with the owners first before letting them get close. It’s quite funny to watch smaller yappy dogs (that pose no immediate threat) bark at him on approach then slowly quiet down and hide behind their owners once they see their bark has absolutely no effect on Gandalf. Other than that, just watching out for cars and keeping him on a short lead if we’re walking around streets because he can’t hear them himself obviously. 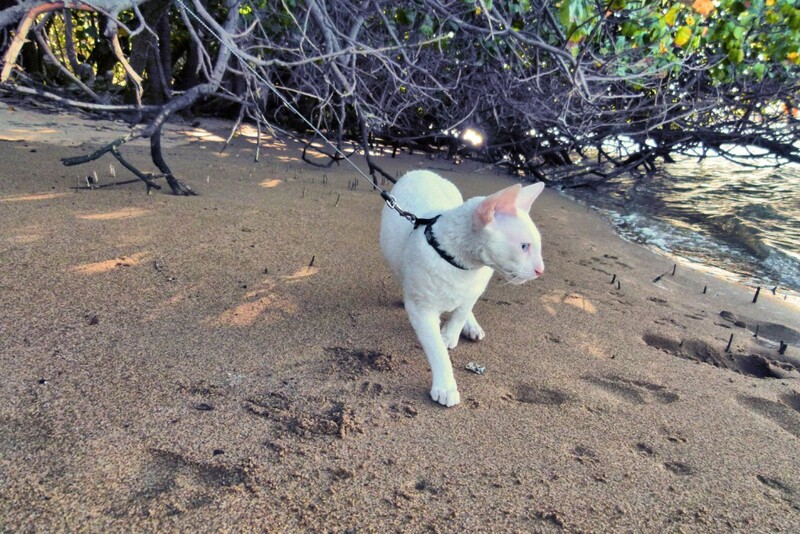 Some cats are afraid of the water, but Gandalf treks the sandy beach like a champ. What part(s) of the world do you guys tend to explore? 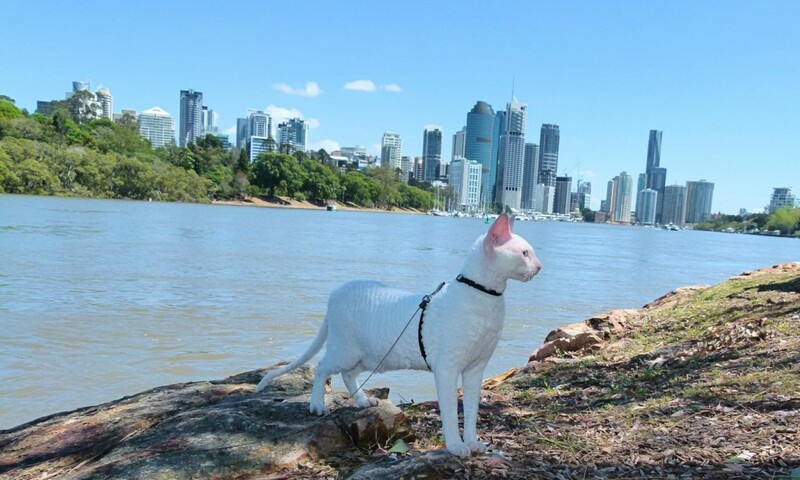 There are lots of really nice outdoor places in and around Brisbane including lagoons, beaches, rivers, local/national parks and even some 20-meter (65-foot) cliffs for rock climbing right next to the city (which G doesn’t do… we leave that to @shadethecat00). I think the beach is probably his favorite though. The Brisbane climate makes for great year-round adventuring too, which is awesome! Of course being a white cat, he is prone to getting sunburned though so he does have to wear sunscreen if we go out in the middle of the day, which he doesn’t mind. Don’t rush them, and learn to read their body language. 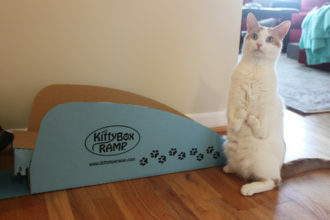 Animals tell us a lot through their body language, and understanding what your cat is telling you is really important when taking them to new environments. Having a plan for if/when things don’t go well is also important. If I’m taking G somewhere new, I always bring his carry bag along so that if a dangerous situation arises or he has had enough I can just entice him back into his carry bag with a treat and either head home or carry him for a while until he calms down. Cats can also be cautious creatures and might take time to get used to different surroundings, so take small steps and don’t rush to the beach or a busy park. Start with a walk around your yard or a quiet park first and take it from there. He may not be a real wizard, but Gandalf has charmed us all. Keep up with Gandalf’s quests on his Instagram, @gandalfthewhitecrx. All photos are courtesy of Martin Henrion.